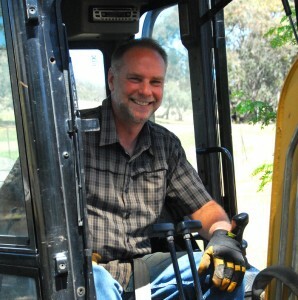 Back here I raved about how much fun I had driving a Bobcat (or, more correctly a skid-steer Cat 226 B2). I’d hired it to clear the site for my new home workshop, a step I’d taken as a result of getting crazily high quotes for others to do the work. Before hiring the Cat, I’d thought it might be rather fun to drive such a machine, but after only a few minutes of driving the Cat around my block, I knew it was much better than that – it was just an absolute blast. So when I needed an absorption trench dug, I didn’t bother getting quotes for others to do it – instead, I went off and hired a small excavator. As with the skid-steer machine, the hire company was happy to deliver the excavator to my place, and – again as with the skid steer – they gave me just a short tuition in operating the machine before heading off. So what did I have this time? The machine was a Cat 301.8, a 1.8 tonne machine boasting only 14kW from its little naturally aspirated diesel. It had a grader blade at one end and an excavator arm at the other, complete with three different buckets to choose from. It ran on rubber tracks. Compared with the skid-steer, it was harder to drive – more levers sprouted within the cabin and their use seemed less intuitive. So it was harder – but was it fun? Well, no, not really. And definitely not in the same way as the Bobcat. 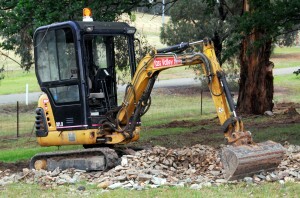 Look, if I get a chance to drive a little excavator again I’ll take it – but I won’t be wildly excited. To me the machine felt like a workhorse, a slow plodder that dug my trench, put the spoil to one side, carried the rocks to fill the excavation, and then pushed the soil back over the top. But its movement from place to place was akin to a snail, tree roots required tedious successive bites with the bucket, and when you tried to do multiple operations simultaneously, you could feel the engine slow. I even stalled it a few times – interesting, when there’s no clutch! Good aspects were its ability to rotate while keeping the tracks still (and it didn’t make me feel sick as I thought it might) and, as with the skid steer, the subtlety of control was impressive. We’ve previously covered in AutoSpeed building your own high quality bike head- and tail-lights. For my money the best design of DIY headlight was the one covered here – it’s super-bright, has a broad beam that has excellent penetration, and is durable. However, there have been two problems will all the light systems we’ve covered: the control electronics, and the battery. To efficiently run high intensity LEDs you need a DC/DC converter that maintains LED current as battery voltage falls. Furthermore, an indication of battery level is important. Finally, it is best if flashing and steady modes are available. Doing these things with DIY electronics is of course possible (and we’ve previously covered some techniques for making your own) but the end result adds up in cost and size. And batteries? To build your own pack that’s waterproof and compact is a harder ask than it first sounds – and then, what about a charger? 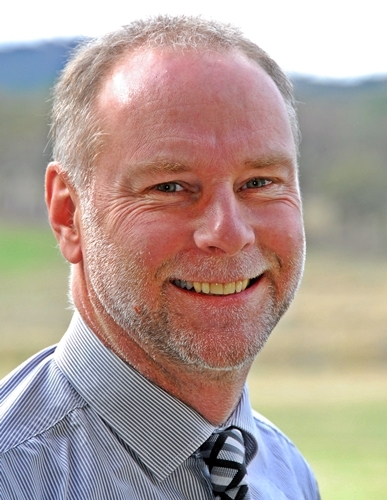 In fact, I’ve tended for my own systems to go back to heavy and relatively inefficient sealed lead-acid (SLA) batteries – despite their size and weight, they’re easy to charge and come pre-packaged. But things are rapidly changing. 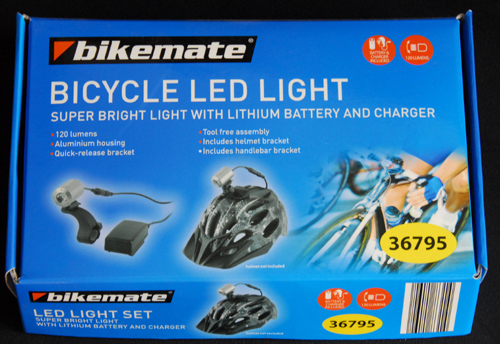 The other day I bought from Aldi (and unfortunately they’ll almost certainly all be gone by the time you read this) a bike headlight system. It comprises a 3W LED headlight, 2 amp-hour lithium battery pack, mains-powered charger and assorted brackets for mounting the lights and pack. The system has switchable full power, half power and flashing modes. 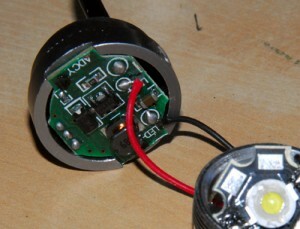 A battery level indicating LED is also fitted. 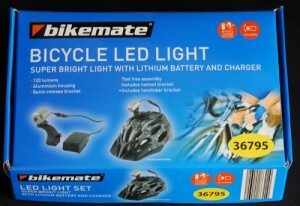 I have been watching bike lighting systems very closely for years, and I can say with some confidence that a year ago, a system just like this would have cost well over AUD$100. The Aldi price? Originally $30 and on special at $20! I bought one set and tested it. Then, on the basis of those tests, I went back and bought another four sets! The smart LED control electronics can also be easily wired to a non-standard light. So I use one system to power the original glass-and-stainless steel 3W headlight I built in the story referenced at the beginning of this piece. Especially with some modifications, for the price I think they’re unbeatable. Back here I described my search for the lightest possible springs for a lightweight human-powered vehicle. Although I didn’t say so at the time, it had been my desire to use rubber – light, cheap and readily available. However, as that article describes, I found it impossible to find a rubber (or elastomer) approach that allowed high spring deflections without overstressing the rubber. High suspension deflections were possible with rubber, but in turn that required high motion ratios (ie leverage) that resulted in large stresses in the suspension arms and spring seats. However, since writing that article in 2007, I have been reading everything I can find on using rubber as suspension springs – and I have to tell you, there’s not a lot around. But today I found a paper that I think is worth sharing with you. I can’t share the content – it’s copyright – but I can say it’s the best treatment of using rubber as vehicle springs that I have seen. It was published in 1956 and the author is Alex Moulton, the man who later developed the rubber springing used in the Mini, and the rubber-and-fluid suspension used in the Mini, Austin 1800, Morris 1100 and other vehicles. You can buy the paper from the Institution of Mechanical Engineers Proceedings Archive here – it will cost you US$30. If you are interested in lightweight vehicles with sophisticated suspension design, I think it’s a must-read.